The WVU Medicine University Healthcare Foundation recently donated $10,000 to the Shepherd University Foundation for the Shepherd Success Fund. The Shepherd Success fund, created by Shepherd University President Mary J.C. Hendrix and her husband, Charles Craft, provides support for the university‘s future by funding initiatives critical for training the next generation. 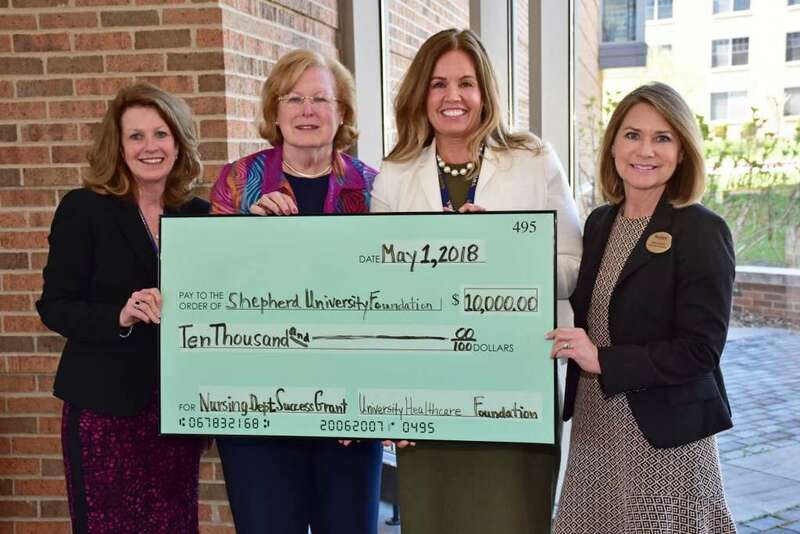 The University Healthcare Foundation’s donation will be matched by the success fund for a total gift of $20,000 to support Shepherd’s nursing department. Pictured (l. to r.) are Teresa McCabe, vice president for marketing and development at WVU Medicine; Dr. Sharon Mailey, Shepherd’s acting dean for and chair of Department of Nursing Education; Samantha Richards, vice president and chief nursing officer at Berkeley Medical Center and Jefferson Medical Center; and Sherri Janelle, Shepherd University Foundation executive director of development. According to Dr. Sharon Mailey, acting dean for and chair of Department of Nursing Education, the money will be used to purchase an abdominal simulation trainer, and a ventilator, and will fund special projects in the department. The mission of the University Healthcare Foundation, which provides philanthropic support for WVU Medicine Berkeley and Jefferson Medical Centers, is to improve health and healthcare services in the Eastern Panhandle. “Collaborating with Shepherd University to strengthen nursing education locally will help support the healthcare workforce at our WVU Medicine hospitals,” said Samantha Richards, M.S.N, M.B.A., R.N., vice president and chief nursing officer at Berkeley Medical Center and Jefferson Medical Center. For more information about the WVU Medicine University Healthcare Foundation, contact Teresa McCabe, vice president of marketing and development, at 304-264-1223, or [email protected].